Good terraced housing development that creates an excellent edge to the street while accommodating the car via rear lane access. 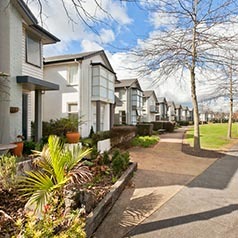 ​​​​​​​​​​​​​​​​​​​​​​The six terraced houses at Buckley Avenue are part of a wider masterplanned development at Hobsonville Point. The redevelopment of the old air base is intended to become a mixed use urban village which will incorporate schools, shops, a marine industrial precinct and a wide range of house types. 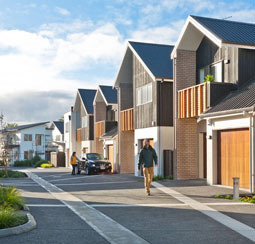 The housing has been developed as a large series of blocks called ‘super-lots’ which have been sold by the Hobsonville Land Company (HLC) to four separate building companies. In 2010 Universal Homes purchased 13,000m2 from the HLC to develop a range of 3 and 4 bed houses. 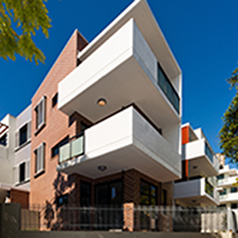 A key driver was to ensure the delivery of high quality houses, that are visually appealing, provide variety in the streetscape, but still have a visual coherence with their neighbour. 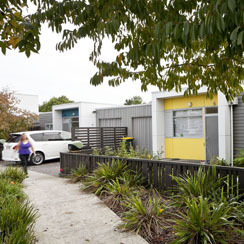 The properties on 59-64 Buckley Avenue have been designed as energy efficient, low maintenance houses for a young family, or for older ‘empty nesters’ who have sold their existing house. The terraces comprise of two corner units and four courtyard houses.